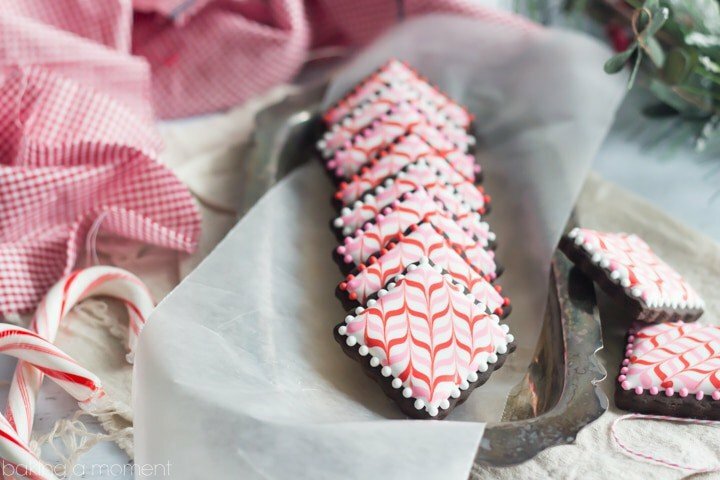 These Dark Chocolate Peppermint Sugar Cookie Cut-Outs are Decorated with Pink and Red Candy Cane Stripes of Royal Icing! Follow my Video Tutorial and enjoy this Fun and Festive Holiday Recipe. Today’s post is coming to you a little later than I would have liked, for a couple of different reasons. One, I really wanted to make it extra, extra good. 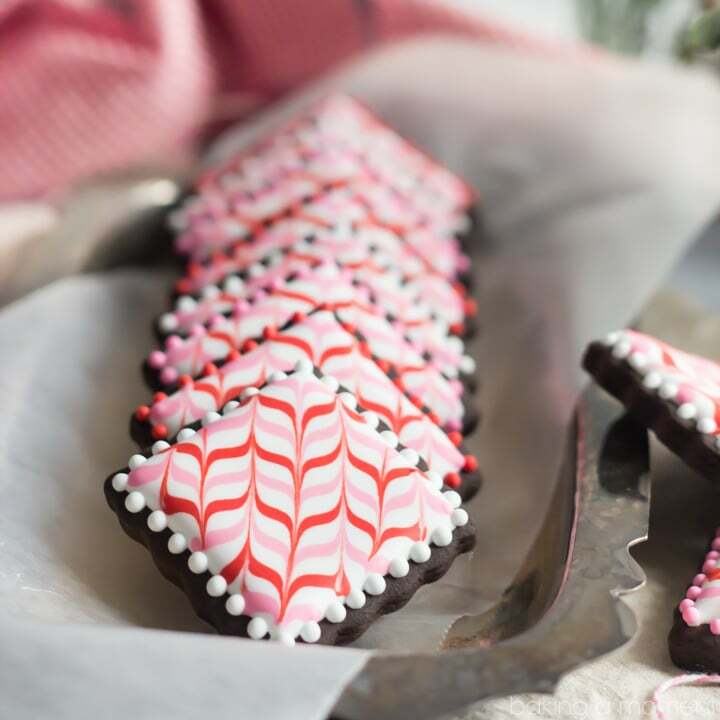 I don’t want you to be intimidated by how pretty these cookies look. So, at the bottom of the post you will find my very first ever video tutorial. It ended up being a little bit harder to learn how to do video in the amount of time I allowed myself. I hope to get better at this with practice, but for now, I think it’s decent enough to get the point across. Hopefully it illustrates just how “do-able” decorating cookies can be. And fun! Also, I’m including a list of the products I used to make and decorate these cookies! I always get asked, inevitably, so I just decided to include a little shopping list for you here, right from the get-go. Please be advised that some of these are affiliate links, so I do earn a small commission from any purchases you might make. As always, they are products that I myself have purchased, use, and recommend. And finally, I would like to share: the last couple of days have been really difficult, and I was completely derailed from my normal routine. Even today, I’m having trouble staying focused, after the tragedy that has ripped through my community. Things like this happen every day, around the world, and it’s always terribly upsetting, but especially when it hits so close to home. My loved ones are safe, but my childrens’ school was under lockdown for two days and our town was advised to “Shelter In Place,” until local law enforcement could guarantee our safety from this sick and extremely dangerous person. I never wanted this space to be political, or controversial in any way. I just want it to be a happy place. There’s a lot of different opinions about why tragedies like this happen, and what should be done. But I only want to say that not a single day goes by that I don’t remember what happened right around this time 2 years ago in Newtown, Connecticut. The terrifying events of this past Monday morning, in my small farm town, brought that sad day even more to the forefront of my mind. Let’s all pause for a moment, send prayers to those who have lost, and count our many blessings. Christmas Cookies! Of the iced chocolate peppermint variety. I made these for the Food Blogger Cookie Swap, which is a really fun event that benefits a great cause. So three other food bloggers were the recipients of this yummy recipe. I hope they enjoyed them half as much as I loved making and decorating them. I can’t decide what I like better, the pretty royal icing design or the chocolate-y cookie base. I love to play with my food, so I always enjoy the decorating part, but the cookie itself is so darn good. Which I think is no small feat. A lot of times, the prettier the cookie, the worse it tastes. But my Simply Perfect Chocolate Sugar Cookie recipe did not disappoint here. I used half regular cocoa powder, half black (dutched) cocoa, and the result was very much like a soft-in-the-center Oreo cookie, with a hint of cool, Christmas-y peppermint. I added 1 teaspoon of peppermint extract to this recipe. As you can see, this kind of cookie is great for shipping to loved ones, because not only are they sturdy, but they stack up so neatly with very little airspace in between. This is so key to having the contents arrive intact. I lined a treat box with wax paper so that the cookies wouldn’t make oil stains all over the paper box. I saw one of the recipients Instagrammed me their package when it arrived, and it looked pretty good, so I guess it worked! Additionally- gel paste food coloring and a few teaspoons more water to thin the icing to the proper consistency. Place the meringue powder and water in a large bowl and whisk until all the powder has dissolved and the mixture is frothy. Add the powdered sugar and stir until combined. Whip on high speed until the icing is very fluffy and stiff, about 5-7 minutes. It should hold stiff peaks. Transfer to an air-tight container until ready to tint and pipe. Add water, about an eighth of a teaspoon at a time, until the icing is the consistency of Elmer's glue. It should smooth over on its own after a few seconds. Place in piping bags fitted with decorating tips, and turn them tip side down into a drinking glass lined with wet paper towels. Thinning to the proper consistency is key. Too thick, and the icing won't smooth over and may have a bumpy appearance. Too thin, and it may run right off the side of the cookie. Be sure to add water just a few drops at a time until the icing is just thin enough to smooth over after a few seconds. Allow the iced cookies to dry/cure overnight, uncovered. 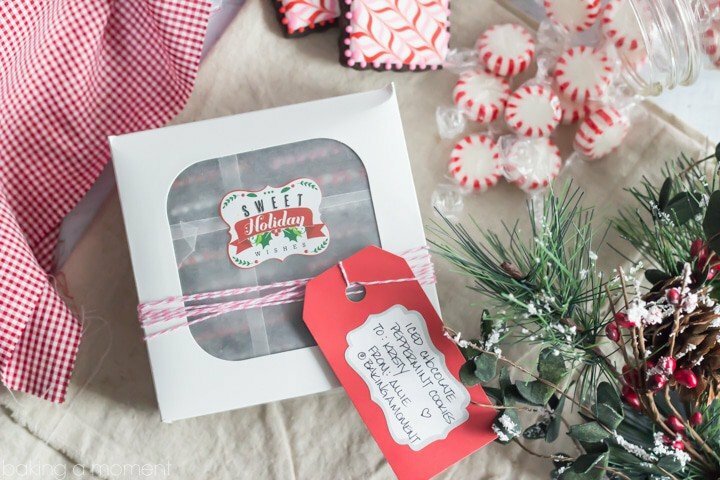 The hardened icing forms a protective barrier that prevents the cookies from becoming stale. Decorated cookies will keep for 2 weeks in an airtight container, at room temperature. And now for the video! The decorating technique is really not that hard, as long as your royal icing is the proper consistency (think Elmer’s glue for this technique) and you work relatively quickly, before the icing has a chance to crust over. Do take notice that the tip of my pastry bag is hovering slightly above the surface I’m decorating. Pulling up and away is what really helps the lines to be straight and not squiggly! You’re letting gravity do the work for you here. Next Post » Grapefruit Bowknots and a Giveaway! Thank you very much Chineka. It was a really scary week but thank goodness things are settling down. And I can get back to baking now, lol! I was way too nervous for a while there. Whew! Wow, that is a really effed up story. Things like that really make you reflect on life, what we have to be grateful for. Sending well wishes your way. Aaaand on the other hand, the cookies look great, and I love the tutorial 🙂 Really explains the whole process well! Thank you June Baby! I know; our whole worlds can change in an instant. Thank you so much for the kind words and well wishes! 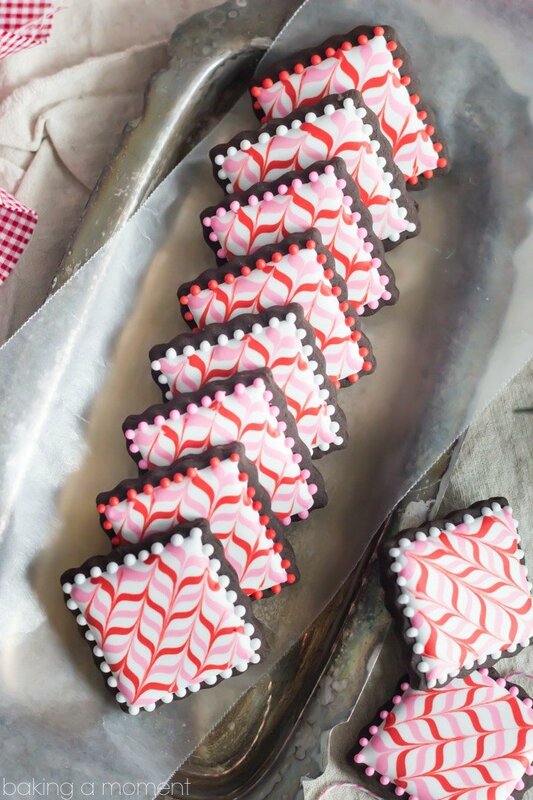 These cookies (and your photography) are insanely beautiful! Wish I could have gotten these in the cookie swap! Aw, thank you so much Just Putzing! That is so terrible Allie! I can’t even comprehend how terrifying that must have been. On a happier note, you are so amazing at decorating cookies! My decorating skills are practically nonexistent, but yours look incredible! And I LOVE the video tutorial! You’ve really got a knack for this kind of stuff. Allie, I am praying for you girl. . I hate hearing about things like that and it just tears me apart to know there’s sickness like that in the world. but sadly, it’s a reality and became real for you and your family recently. I am just glad that you guys are safe and it’s over. I didn’t click on the link because I didn’t want to read the story but am basing this off of just what you told us. . anyway, I think you said it well above- “Let’s all pause for a moment, send prayers to those who have lost, and count our many blessings.” I feel weird talking about cookies but these are beautiful and I absolutely loved the video, Allie. Allie, I was so worried about you, not sure if you got my message, but so glad to see you back. Sorry to hear what happened, that’s so shocking. On a brighter side, these cookies are so festive and you did a great job on the video, too. Thank you so much for the positive vibes Samina! I feel like I really need them after the week I just had. My hair is gonna turn gray, oy! And thank you for the awesome feedback on my cookies and video. I had a lot of fun making the video and I hope to do more. Looking forward to learning and getting better at it! I love, love the video tutorial! I’ve been toying with the idea of doing video tutorials for cookie decorating, so this is super inspiring. And bravo on the cookie packaging! I mail decorated cookies all the time, and it can be nerve wracking! I’m sorry to hear that you were feeling unsafe in your own community. It’s so disheartening that we are living in such a dangerous world. Every night I pray that God protects my children and all children around the world. So do I, Aida, so do I. It’s a scary world we’re living in. Thank you though, for your kind words and yes- you should definitely try your hand at video! It’s another fun medium to learn and you are so talented- I think people would love to see how you make your fabulous creations! You’re cookies and new video are perfection! I’m so impressed with videos on blogs, and a place I have yet to explore. You’re an inspiration! Excellent pressure control on that piping, Allie. I know that took much practice! I hope peace finds you and your community again soon, Allie. Thank you so much Traci, for your reassuring and kind words and for the great feedback too. I am just beginning to dip my toe in this whole video world. Looking forward to getting the hang of it soon, lol! Allie you are an artist! I still don’t think I could make them as perfect even after watching your tutorial! Loved it and I love these cookies. They’re almost to pretty to eat. Merry Christmas & Happy New Year to you and your loved ones. Wishing you all the magic of the season. These are beautiful!! Loved the video!!! Thank you Kelly! For the prayers and for the kind words too. Things are returning to normal finally, but whew! I’ll be hugging my boys a little harder this holiday season. Your cookies are so beautiful. I stopped by to check them out then read your story. My heart goes out to you and your community. I hope you all have a wonderful holiday season, what’s left of it, anyway. Thank you so much Beth. It’s been a rough week but things are getting back to normal, and I’m so happy have the holidays coming up soon to get our minds on to happier things 🙂 Thanks for reading and for the warm wishes! Allie, I’m so sorry to hear about this senseless tragedy. But it’s good to hear that you and your family are safe. These cookies look stunning. Much more beautiful than I could ever do. You have amazing talent! Gosh, I saw that on the news and had no idea that was near where you live. That is so tragic and scary. Glad it’s over and that your family is safe, but I’d be seriously rattled too! Allie, my stomach dropped when I heard about that terrible tragedy and I’m sending you a big virtual hug. It’s so hard to think that this world that has so many beautiful things (like these gorgeous cookies) can also have such horrible things. This is such a good reminder that the holiday season is for holding those we love a little closer. So very true, Amy! You have such a beautiful way with words. Thank you so much for this! Oh Allie, that is horrible. It seems like those things should only happen on the news (well not at all!) but when they hit close to home, it’s terrifying. Thanks for including that in your post, it’s an excellent reminder! My jaw dropped when I saw these cookies. They are freaking gorgeous! The detail is stunning, I didn’t know cookies could be so pretty! Thanks for the tutorial (you rocked it btw) and the list of cooking tools. Pinning! I can’t even get over how stunning these are! I’ve always been petrified of icing cookies as I think I’m far too clumsy, but your video is great! I had no idea you could shake to help it settle or anything – so cool! Mind you, I don’t have steady hands at all, so I doubt I could get lines as straight as yours!! I bet you could Annie! It doesn’t take long to get the hang of it, and the shaking trick is so key 😉 Glad you enjoyed; thanks for the great feedback! These are simply gorgeous!!! And I am thinking of and praying for your community and the victim’s families. Such a tragedy that shouldn’t have happened. I was thinking of you this week when the tragedy stuck, I’m so glad your family is safe but so sad for all those involved and touched by the incident. On a happy note, these cookies are absolutely stunning! I would have been a little intimidated to try the recipe since I’m more cook and less baker but the video totally made it believably doable. 🙂 Thank you! Okay, first of all I wanted to say these are freaking gorgeous and they made me stop in my tracks on Foodgawker. But then I read your post and I was so disheartened. I am so sorry – it’s truly scary to have kids and let them out into the world. I understand. We just moved to Portland OR (from Boston) and my kids had a lockdown because of a shooting at a nearby high school. I thought Portland would be safer! Oh my god the decoration on these cookies is just incredible Allie! Seriously exceeded yourself here, I almost wouldn’t want to eat one and lose all your hard work! These look incredible Allie! I could never pull off icing like that. My hands shake way too much. Tried, got frustrated and stopped HA! It’s been over a year now since I tried but I’m dying to give it a second chance after seeing how easy you make them look. Big props on making a video! Thank you Connie! I sometimes start out shaky too but with this kind of technique it really doesn’t even matter. The icing settles into place and you’re dragging the skewer through it anyway so no one ever knows the difference if your lines aren’t straight. Thanks for the great feedback! I’m looking forward to playing around with video more and hopefully getting better at it 😉 Hope you have a wonderful holiday! These cookies look gorgeous! Great presentation and I’m sure they are delicious. The video tutorial is awesome and very helpful! Thank you so much! And happy holidays to you! I can’t even imagine how scary that must have been. But so glad that you and your family are safe and okay. On a happier note – these cookies are just gorgeous! I haven’t used royal icing in months … it’s time to dust off my supplies and make some pretty cookies! Now is the time! I enjoy decorating with royal icing all year round but honestly Christmas is just made for it. So glad you enjoyed and thank you for the kind words. Merry Christmas! Absolute perfection! I am in awe. Too pretty to eat and I admire your patience and skill in decorating them. Pinned! And these cookies are so beautiful Allie! The perfect Christmas cookie! Thank you so much Kayle! Hugs to you sweetie! Sending many thoughts for hope and healing for you and your community, Allie. What a terrible tragedy. On happier note, out of the hundreds of entries to the Food Blogger Cookie Swap, yours was the one that stood head and shoulders above the rest. Absolutely GORGEOUS! I knew I’d have to give them a try right away so I baked up a batch this morning. The cookies are perfect! So easy, a dream to roll out and just the right sweetness. I even tried my hand at decorating for the first time and while I’ve got miles to go before I’m one tenth as good as you are, I have to say my efforts were…not awful! In fact, you’ve inspired me to find a decorating class so I can get better at it. Love the cookies, love the decorating, love the photos, love the tutorial. Thanks so much for sharing these! P.S. Can I ask what size piping tip you used? I think mine was a bit too large. That is so wonderful! I am so happy to have inspired you and so glad you took a moment to share that with me. You have truly made my day Robin! PS- there is a link to the tip I used at the bottom of the post; it is a #2 by Wilton 😉 Good luck! These the so cute! The video tutorial was awesome! Thank you Julianne! Hope you had a lovely Christmas dear! These cookies look so AMAZING! Your bakes always impressive me and are super creative! The tutorial was very helpful Allie! Have a happy Christmas! Thank you so much Jess! Hope your Christmas was magical- and wishing you a fabulous New Year! Allie…. these are majorly impressive! Like, you have some serious cookie decorating skills! And LOVE the video… you totally need to do more of them! Amazing! A tragedy like this one is very difficult to process, because it’s beyond our understanding. As to the cookies—basically you are a talented show off. I am laughing here. Splendid cookies. I agree with the Blahnikbaker! And on another note, thank you for sharing your thoughts about the Newtown tragedy. My thoughts and prayers are with your town and those families right now. It is a scary world we live in and it’s hard to come to terms with these horrific acts. I enjoy food blogs and recipes as much as the next person, but sometimes it’s nice to pull down the veil and connect on a different level. Virtual hugs to you as you all continue to heal. Thank you so much for this, Elizabeth! It’s difficult to talk about, but it couldn’t be more true- not a day goes by where I send my kids off to school and don’t remember Newtown. These kinds of things happen way too often. And thank you for the sweet compliment about my cookies. Coming from such a talented artist as yourself, it truly means so much! It is truly sad! And only God can make right what was made wrong. Prayers for all who were affected by this tragedy. I’ve missed you! Glad you’re back. Have a wonderful Christmas Allie! Allie, when are you going to go into business selling some of these beautiful things. They are actually beyond beautiful … love them and how wonderful to have a video showing us how to make them! So sorry that you’ve had to deal with this awful tragedy. You’re right that you never think these kinds of things will affect you personally … really sorry that something has. I have been meaning to tell you that I absolutely loved the video tutorial. I never vigorously shake my cookies the way you do, and then wonder why the colors don’t slightly bleed together seamlessly. 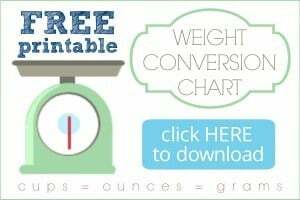 What a simple little trick that makes such a huge difference! I hope you had/are having a wonderful holiday! Allie, what a powerful post! I feel so blessed to have been one of the recipients of your beautiful and tasty cookies! I pray that 2015 proves to be one of peace and happiness for you, your family, your community, and our nation. God Bless You! I’m a bit late to this post, and I think the link you posted of the news story is no longer available. Whatever it is, I’m completely with you about just wanting a safe community to live in . . . Anyway, I also wanted to say how much I adore these cookies. I definitely need to up my cookie decorating game a bit more this year, so thanks for the video tutorial! Ugh I’d fill you in on all of it, but to be honest I’d rather just forget about the whole miserable thing! It was a nightmare and the bottom line is, just as you said, feeling terrified and unsure of my own and my family’s safety. I’m so happy you enjoyed the video tutorial! I love decorating and I’m so glad you’re into it too Lisa! Thank you so much Kim! So happy you liked and glad you stopped by. Hope your year is off to a great start! Are those candy beads around the edges or dots of the white icing? 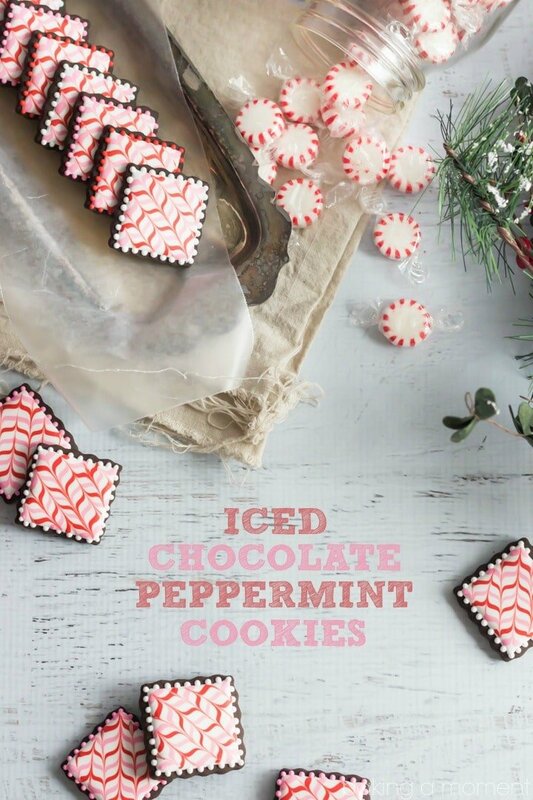 The Chocolate Sugar Cookie recipe does not have peppermint extract, but you note to add 1 tsp. Is it in addition to the the 1 t vanilla extract or to replace vanilla extract. Really you could do it either way, Debbie! It’s totally up to your taste. I believe when I noted to add it, I meant in addition to, but you could certainly replace if you felt so inclined. Thanks so much for reading and for the great question! Allie, thank you for these beautiful cookies and tutorial! I’ve looked through literally hundreds of recipes for a unique cookie to make for my mom’s cookie exchange and yours is the winner for this year! Question: did you use the same piping for the dots on the edges or does that have to be a little thicker to hold shape? Thanks very much. Keeping your community in my thoughts. Happy Holidays! I’m so glad you like these cookies Christina! Gosh it brought me back when you mentioned about my community. That was just about a year ago and it still makes me shudder when I think about it. I’m so glad it’s all over. As for the piping, I did use the same icing for that, but that’s a really great question. A thicker consistency might actually be a little easier. But I find that if I keep the dots quite small, they manage to hold their shape without running over the edge of the cookie. I hope that’s helpful! Thank you for reading and for the great question; I hope your cookies are the hit of the cookie exchange! Happy Holidays to you as well! I made these little beauts for a cookie swap that I held over the Christmas holiday. I asked my guests to bring 2-3 dozen of each type of cookie. I used a smaller than average cookie cutter and had to almost triple the recipe to get 2-3 dozen. But I did not mind because the cookie dough is fabulous! I made them a week prior and they froze nicely. They were not as sturdy as I was expecting them to be, so beware they may still be soft and break if you aren’t careful. I will be using this recipe again. I am glad that Allie put the icing tutorial in the post for icing deficient people like me! My cookies did not look at all like hers, but they were still the most beautiful cookies on the table for sure. I may try the icing and decorating again when I have more time to devote to the process. If you are rushed, I would not recommend decorating them as pictured. You may end up becoming frustrated and vow to never use royal icing again (like I did). Anyway, those are my takeaways. I think this is a great recipe. Thanks for the great feedback Holly! Hi Allie! Question about your Royal Icing recipe…does it dry rock hard? I’ve been on the hunt for a RI recipe that won’t break your teeth when you bite into it, but still dries firm enough to stack cookies. Thanks for your help an awesome recipes! Hi Em! It’s my pleasure! To answer your question, yes it does dry to a candy-like finish. I usually make it really stiff and fluffy, and then thin it down with water (just a drop or two at a time) until it gets to the right consistency where it can smooth over easily and not be too thick on the cookie. I agree, no one wants to break a tooth! Hope that’s helpful; let me know if I can answer any other questions! Thanks for the quick reply, it’s awesome (and appreciated!) that you’re so responsive to your readers! My kid is obsessed with peppermint! This is an excellent recipe! These are absolutely beautiful. I made the sugar cookies yesterday and they turned out perfectly. Today I’m going to tackle the icing. I have one question. How long did you let the white icing dry before piping the stripes? Or can I do that right away? Thanks so much. So happy you like them! Pipe on the stripes right away, while the icing is still wet. That way everything will be level and smooth, rather than more 3d/textured. Hope that makes sense! Have fun decorating! Thank you for so many wonderful recipes and helpful hints to make everything turn out perfectly!!! It’s my pleasure Sheri! Hugs!